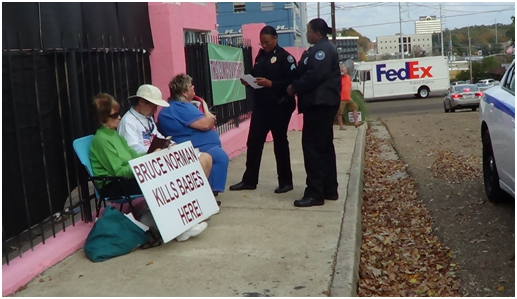 Last week, Life Legal Defense Foundation filed a civil action against the City of Jackson, Mississippi for violating the civil rights of pro-life advocates who sidewalk counsel outside the state’s only abortion clinic. The City has engaged in pervasive practices of unequally applying the law so as to squelch the pro-life message. As was outlined in the complaint, the Jackson police force engaged in conduct calculated to harass, threaten and intimidate pro-life speakers and silence their life-giving message. This week, rather than correcting these practices, the City of Jackson took them a step farther by prosecuting and convicting peaceful pro-life advocates for trumped-up charges. Four pro-life advocates who have peacefully engaged in education, outreach and prayer on the public sidewalk outside the Jackson clinic were set for trial this past Monday. One case was so far-fetched that it was dismissed before trial. Harriet Ashley & other pro-life advocates on day of arrest. But three pro-life defendants were found guilty! Pro-life advocate Chet Gallagher—a former police chief himself—was found guilty of “interfering with a lawful business.” Harriet Ashley and Roy McMillan were found guilty of “obstruction.” This is a convenient offense that is worded broadly under the criminal code, but which is never applied to pro-abortion speakers, no matter how much of the sidewalk they block. In the cases of Ms. Ashley and Mr. McMillan, the defendants never blocked sidewalks or impeded traffic, leaving a minimum of four feet of free space on the sidewalk for any passerby to utilize. 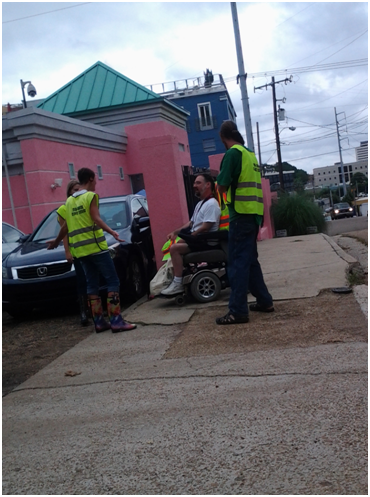 The court commented that in order not to run afoul of the obstruction ordinance, demonstrators would need to “keep moving.” At the same time photographs demonstrate that pro-abortion protestors sit and stand in the same manner within the same space on the sidewalk, yet have never been threatened, arrested or prosecuted. Pro-life advocate Chet Gallagher was convicted of the crime of “interference with a business,” despite the fact that the City could not prove an essential element of the crime—that the defendant was ever “on the premises of another.” Mr. Gallagher was on and remained upon the public sidewalk in his pro-life outreach, which consisted of peacefully street preaching and praying for the women entering the clinic. His conviction is but one more example of the lengths to which Jackson law enforcement will go to protect the local abortion industry from even the slightest forms of dissent. Adding insult to injury, the judge ordered all three defendants to say away from the “vicinity” of the abortion clinic. This attempt to impose a permanent injunction on the pro-life advocates not only overstepped her sentencing authority, but also suffers from inherent vagueness. Life Legal Defense Foundation is working with local counsel Steve Thornton to fight these outrageous convictions. The defendants plan to file appeals next week. The clinic where these abuses of justice are taking place is Jackson Women’s Health Organization, which was also the subject of this week’s Fifth Circuit Court of Appeals decision enjoining Mississippi’s efforts to protect women.